“What do you need from heaven tonight?” asked the pastor in the opening portion of worship at 4.30pm gathering of Hillsong in the Atheneum Theatre in Melbourne’s CBD on October 1, 2017. The transcendent reference in his question echoed other language in the service: that we might be “marked by heaven,” for instance. But other talk from the pastor held the assembly in time and place: it was Grand Finals Weekend, with Melbourne teams in both Australian rules football and rugby league matches that weekend, and numerous references were made to the games. The theatre was packed for the service—one of four that day—and, in fact, it was larger again in the sense that other assemblies in Melbourne west, Hobart, Perth, and Bali (all referred to as “campuses”) were being beamed in to hear the sermon (“message”) while they met together elsewhere. What their gatherings consisted of is not clear to me; for example, whether they had a live pastor and live musicians in their place and watched only the message on screen, or whether they somehow participated in the whole event in the Melbourne theatre via technology. In any case, the Melbourne venue itself involved a mix of live presence and recorded or projected elements. For example, “church news,” in the style of television advertisements, and for small groups (“One Hour Connects” offered at different times of the week, for example, “after an early morning surf”) were played on screen while the assembly sat in their bucket-seats as they might in any cinema. An interview with a Hillsong songwriter was also presented in this way. Most intriguingly, the “public baptisms” which were advertised as part of the service did not take place in the room, but were shown, live, on screen, with one baptisand after another being plunged into a pool during the opening set of songs of praise. In Melbourne, we heard neither their names nor their testimonies, nor the triune name of God in a baptismal formula. Rather the two large screens to the side of the stage simply featured the sequence of immersions. The larger screen, behind the stage, showed song words, which were then regularly interrupted by cheering and whooping as each newly baptised person surfaced from under the water. The group of baptisands, like the those gathered in the Melbourne theatre, was culturally diverse. In the theatre, African, Asian, Middle Eastern as well as Anglo heritage were all well-represented. The gathering was also intergenerational, though with a notable preponderance of young adults. At the Melbourne venue, children’s groups for persons up to school year six were provided during the sermon. The music which was played was largely guitar-based, “crap rock,” in a style for which Hillsong is known. It was produced by a dozen or more music-makers busy on stage playing guitars, bass, keyboards, drums, and singing and dancing (one at least sporting a football team hat). Intriguingly, the song words were mostly much-repeated couplets, folded into verse-chorus patterns. The volume was loud enough to make bass-notes cause the the floor to shudder, and perhaps encourage movement. It did, with many of the assembly not only singing along but standing orant (arms high, hands up), and dancing. The theatre itself was darkened for these songs of praise, the screens and stage lights with the music creating a concert-going atmosphere, and the darkness perhaps also encouraging the expression of uninhibited self-giving which some of the songs spoke about. The main message was given next, and took half of the whole time of the event. It was given by a visiting preacher from Hillsong in Los Angeles, California, USA. He was a charismatic young man who bounded around the stage like Tigger while preaching, always avoiding the props—a bar table with Bible and bottled water—and in doing so betrayed his highly polished art. This was, he told, a talk he had given elsewhere before, and one he might have practiced, given its “performed” quality. The talk focused on just one verse of scripture—2 Timothy 2.1, read from the King James Version: “You therefore, my son, be strong in the grace that is in Christ Jesus.” This text appeared on the large screen behind the preacher, as from to time did various points of emphasis from the message itself. The talk started by setting the verse in its most immediate context, following as it does chapter 1 of 2 Timothy, and connected to the earlier chapter by the word “therefore.” It went on to make many other biblical references, though interestingly, these other references were not always acknowledged—sometimes a quote would simply be recognised by noting “that’s Bible”—so that some degree of biblical literacy would be needed by hearers to recognise the biblical texture of the talk. And as well as connecting to other portions of scripture, the message also alluded, again usually without acknowledging the source, to both traditional hymnody and words of a number of Hillsong songs. Curiously, like Paul’s parental relationship to Timothy (“my son”), the preacher related that a travelling companion accompanying him had been converted through his own (the preacher’s) ministry and gone from drug dealer to Christian, joining the staff of the LA Hillsong church, and had got married and was now a parent to be, but the companion did not speak for himself. In fact, only the pastor and preacher spoke at microphones, though others of course sang (and I later learned that this evening’s men-only voices was perhaps happen chance, as on other occasions women preach). The end point of the testimony was also his companion’s marriage and imminent parenthood, which mirrored he preacher’s own way of starting his message with anecdotes about his own wife and children. The echo of the biblical text, in a father’s oversight of a son, was not made explicit. And neither was the heteronormativity of both of their stories, which may or may not have been a way in which another feature of the time and place—midway into the national postal vote on equal marriage—was albeit obliquely engaged. Those who raised their hands were then asked to repeat the words of a prayer by the preacher. The form and content of this part of the service would be familiar to anyone acquainted with many forms of evangelical worship, including older forms of Pentecostalism. It is perhaps notable that longstanding traditions of both evangelical and Pentecostal liturgy were retained in what happened next without the contemporising, that marked the rest. Notably, this portion of the service was the only time unison or “call and response” words for prayer were used. Though no words were written down, they were said in unison repeating those spoken by the leader. This prayer also featured the only address to God as “Father” (who had been named directly as “God”—without further descriptors, or adjectives—in previous prayers). It was further the only point in the service which, as opposed to the (albeit grace-filled and powerful) present ministry of Jesus, identified aspects of the life of the “historical” Jesus, traditionally cited also in creeds. The cross of Jesus effecting atonement was right at the heart of this prayer. These practices of naming God and stating the faith doctrinally perhaps show a conservatism with Pentecostal tradition (shared with other Christians) of the “altar call” which points to this being the most important and durable element of Hillsong worship. The final song of the evening was “Real Love,” in the genre known as electronic dance music (EDM) which characterises some of the newer Hillsong music, known as “Y&F” (young and free?) and apparently directed towards those who are younger than those—perhaps now of middling-age—formed by the guitar-based praise music for which Hillsong is best-known. A stand alone, it was in a different mood to the songs earlier in the evening, and to my (middle-aged ears at least) somewhat incongruous with the rest. It might be that the children under twelve years of age had now returned to the theatre from their groups, as the dancing on stage that accompanied this song seemed to me like a toddler’s disco, Yo Gabba Gabba meets The Wiggles. Finally, those who responded to the message by raising their hands at the altar call were encouraged to collect a free Bible from stewards in the foyer on the way out. The Bible was in fact a New Testament, and its cover included the words of the prayer that had been prayed aloud at the altar call, and those taking them away could leave details (but were not required to) to allow for follow-up. This Bible itself is very interesting, a special production for Hillsong of the New Living Translation, and according to its opening pages done with a dual audience in mind. First, for readers from visual cultures. So the book had the look and feel of a magazine, part travel brochure, part lifestyle periodical, including numerous images of young people orant at worship in strobe-lit arenas. Second, to enable understanding by readers entirely unfamiliar with the Bible. To this end, the canonical order of the books (that is, the—to the biblically-literate—familiar pattern of gospels through epistles to apocalypse, from Matthew to Revelation) was not used, but rather an entirely different one, to which thought about accessibility had been given. The whole started with Romans, and the collection was divided into parts, the first three parts each ending with a synoptic gospel. The fourth and final was largely Johannine. Double page articles on various topics by Hillsong pastors intersperse the re-arranged scriptures. One aspect of the service troubled me. As the preacher was welcomed to the stage by the pastor, the assembly was invited not only to stand but also to applaud. This then led to a kind of litany by the preacher in his turn who asked for applause for various pastors of the church, culminating in the founder of Hillsong, Brian Houston. While the clapping was narrated as a way of expressing appreciation for the pastors—itself a good thing—it seemed at odds with those elements of the message which stressed the demands and sometimes lack of recognition that can come with opting for Christian service. Then, at the end, when we were told that the preacher had gone to rest after giving his message, rather than remain with the worshipping assembly, only added to the sense that the pastors were seen as apart from, not a part of, the assembly. The ritual repertoire of Hillsong, while being very strong, does not include the like of wafting of incense at priests in the liturgy, but the acclamation and applause for leaders, the effective distancing of them from others, seemed to me to reinvent this unhelpful tradition and related quite problematic notions. I find this impossible to appreciate, notwithstanding the otherwise refreshing reminders of the immediacy of grace that the rest of the service arrestingly stressed. And one final thought, in a more appreciate mode: the service was advertised as one of “public baptisms,” and these featured strongly in the first part of the service, albeit in some ways that seemed a little odd to me, expecting as I had done that the baptisms might be of persons in the room. Though I have questions about hearing neither the name of the Trinity into which Christians are baptised, nor the names and something of the faith journeys of those being baptised, this aspect of the service challenged me to consider baptism anew as the church’s public witness. In many other churches (especially in old-line traditions) around Melbourne on that or any other Sunday, holy communion would have been the gospel sacrament which people could have witnessed or joined in celebrating. Communion can, though, easily and widely be experienced as a barrier, as excluding (with baptism, not least, a “hoop” to participation), even when the liturgy itself is not doctrinally or ceremonially obscurantist. 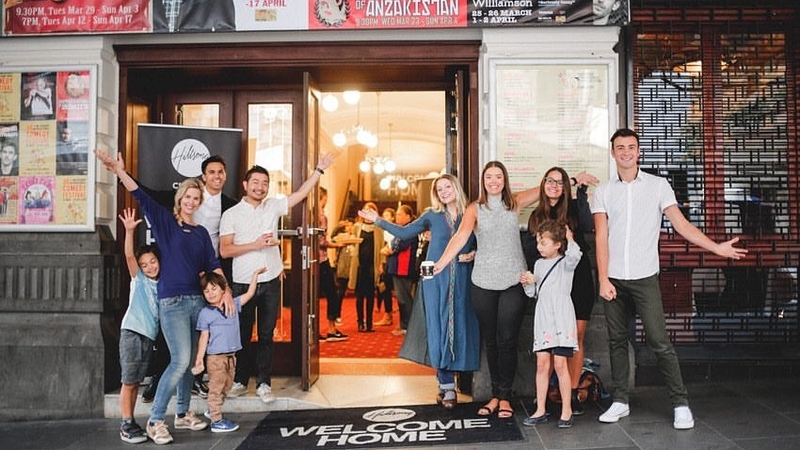 At Hillsong, communion does indeed take place on some Sundays, regularly but not always, as well as happening in small groups dispersed in members’ homes at other times. But it is baptism that is centre stage—even when the baptisms are elsewhere, and shown on screens just off centre stage, and then mixed in as one part of a larger action: worship, involving hundreds present here and now. In this context, the baptisms that flashed across the screens enacted the personal, dishevelling, and apparently joyous experience for which the whole event of worship at Hillsong was giving words and gestures, and which we were rightly assured is open to all. After a near century of many old-line churches making holy communion their standard fare for Sundays, the neo-Pentecostalism of Hillsong with its making baptism central to Sunday worship may well be a sign of the vivid and evidently attractional spirituality that will, more and more, best mark at least the near future of Christian worship.